D.J. 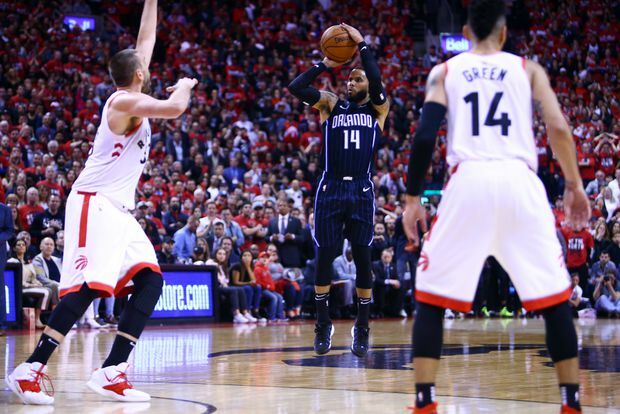 Augustin #14 of the Orlando Magic shoots the game winning shot during Game One of the first round of the NBA playoffs against the Toronto Raptors at Scotiabank Arena on April 13, 2019 in Toronto, Canada. After collecting a victory in Game 1 of an NBA playoff series between the heavily favoured Toronto Raptors and the visiting Orlando Magic, the winning point guard stepped to the podium to discuss his impressive 25-point performance and his game-winning three-pointer. But it wasn’t Kyle Lowry. Orlando starting point guard D.J. Augustin was the hero of the day as No. 7-seeded Orlando upset No. 2-seeded Toronto on Saturday, 104-101 — a guy who once played 10 games for the Raptors back in 2013. Lowry went scoreless on 0-of-7 shooting, but he did contribute eight assists and seven rebounds. It was Kawhi Leonard who led Toronto in the loss. He had 25 points in his first post-season game as a Raptor – seven of them in a furious fourth quarter that saw the two squads go bucket for bucket. Pascal Siakam contributed 24 points while playing 42 minutes – the most of anyone in the game. Danny Green and Marc Gasol had 13 apiece. As is typical in Toronto in the playoffs, Scotiabank Arena was packed and ear-splittingly loud. The crowd was awash in red ‘We The North’ t-shirts. Thousands more gathered in Jurassic Park outside at Maple Leaf Square, hollering and singing. The Raptors made blockbuster moves to secure players like Leonard, Green and Gasol, and it was finally time to kick off the post-season. Fans sung along to O Canada and stood to applaud as recently traded-away Raptor Jonas Valanciunas arrived to take his court-side seat and watch his old teammates. The Raptors built a 30-25 lead through the first quarter, as Leonard lead the way with 11 points in his first nine minutes on perfect 4-for-4 shooting. The Raps were clipping along at 52.2 percent from the field, and all seemed in hand. But then things collapsed for Toronto in a chaotic second quarter. Leonard went 0-for-5 in the quarter as Magic players stuck to him and collapsed on him every time he forged into the paint. Augustin went off for 10 of his 19 first-half points. Lowry stood stoically to draw a charge from another ex-Raptor – Terrence Ross – and absorbed a hard-charging knee to his groin, hobbling off in anguish in need of a breather. The Raps would shoot an abysmal 30.4 percent in the quarter as the Magic ruled the stanza 32-19. The No. 7 seed took a commanding 57-49 lead into the locker room. Raptors coach Nick Nurse used just nine players in Game 1, calling only Norman Powell, Serge Ibaka, Fred VanVleet and Jodie Meeks off the bench. The Raps were missing OG Anunoby following his emergency appendectomy, as well as Patrick McCaw, who continued to mend a sprained right thumb. To help cope with Anunoby’s missing minutes, the Raptors at times shifted Ibaka from the reserve five spot to the reserve four. The Raps regrouped in the third and wrestled back the lead. Siakam exploded with athletic dunks and put-backs. Leonard was thriving again. Toronto held a slim five-point lead going into what would be a tense final quarter. The foes traded buckets and played tug of war with the lead in the final three minutes of the game. The crowd erupted for baskets from Gasol and Siakam, then went silent as Jonathan Isaac and Evan Fournier scored on the other end. Leonard scored back-to-back baskets for a two-point lead, and the crowd serenaded him with chants of “M-V-P”. Augustin would score on a finger roll to tie it, then come right back for more. A costly miscommunication on defence between Gasol and Leonard left the Magic point guard with a fleeting three-point opportunity some 28 feet out. “When I saw the opening, I shot the ball with confidence,” said Augustin. Leonard then missed his game-tying shot attempt in the final second. Nurse said Orlando was not doing anything special on defence to stop Lowry. Game 2 takes play Tuesday in Toronto, before the series shifts to Orlando on Friday.